Kelsey Kruse (‘20) competing against Augustana-Rock Island earlier in the season. 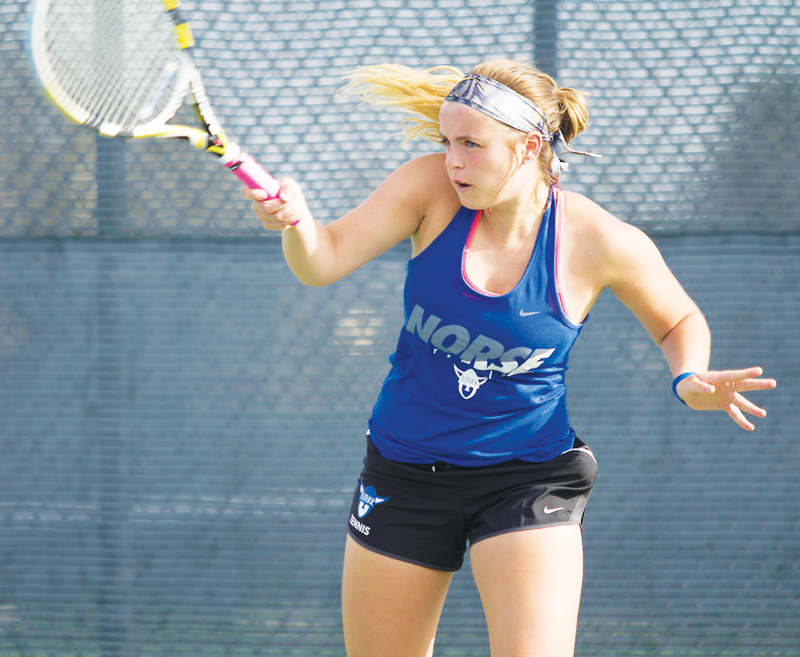 Luther Women’s Tennis competed in the National Automatic Qualifier tournament at home April 28-29. While the No. 1 seed Norse advanced to the finals, they ended up losing to Coe College 5-4, just missing a berth in the national tournament. The season has been challenging for the team, but they have made a lot of progress, as Emilyn Ryski (‘18) explained. The first semi-final matches began with Luther playing Central. In singles competition, Luther took home two wins including Luther’s Lauren Welch (‘17) vs. Coe’s Walter with a final score of 6-0 and 6-1. The other singles competition win went to Luther’s Claire Christian (‘18) with a final score of 6-0 and 6-2. Luther swept the doubles competition against Central with match wins from Luther’s Britta Pressler (‘19) and Welch vs. Central’s Maley and Walter (8-1), Luther’s Christian and Jackie Cychosz (‘18) vs. Grindberg and Vannausdle (8-2) and Luther’s Madisen Crow (‘17) and Kelsey Kruse (‘20) vs. Krumm and Stewart (8-1). With these wins, Luther advanced to the championship match. The competition continued that day as Coe took on Loras in several semifinal matches. Coe swept the doubles competition giving them the opportunity to compete against Luther in the final that afternoon. Championship singles matches began with several Coe wins, including matches between Luther’s Cychosz vs. Coe’s Resnick (6-1, 6-4) and Luther’s Welch vs. Coe’s French (6-0, 6-0). However, Luther took home two wins with Pressler winning her match 7-5, 6-0, and Kruse winning 6-3, 6-2. Doubles competition began with another Coe win. Only Luther’s Christian and Cychosz (8-0) and Crow and Kruse (8-0) won doubles matches against Coe. At the end of the day, Coe took home the 5-4 win and automatically qualified for nationals. Going into the tournament, the Norse had a 14-11 record including a 7-1 record at home, 3-6 on the road and a 4-4 record in a neutral destination. The whole season has given the team opportunities to play many ranked teams. The season has helped prepare the players for the qualifying tournament, according to Halverson. Despite falling short in qualifying for the national tournament, the team had a good season overall. Ryski was pleased that the team’s spirits were high at the end of the season. The women finished off their season with a record of 15-12.